Lisa I know from reading your blog that you’re an optimist at heart. And a clever one too. Yay! 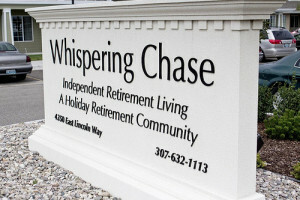 But why would an old-timer’s place call itself “Whispering?” How infuriating for the residents. I offer up: We Speak Loudly Lodge. Well, they’re trying. That’s all I can say in their defense. They’re trying to put lipstick on a pig. but a pig’s a pig, still…. Demented Gardens is my favorite! Bedpan alley gets my vote. Too funny, but also too close to home…? I’ze rather partial to your “Over The Hill Terrace”. Did you ever see any of the Britcoms called “Waiting for God” which featured Stephanie Cole and the late Graham Crowden. (Unfortunately has a laugh track) You can probably find the series at your library. I’ll look for it. Thanks! Well it’s not great “theater” but amusing in its way. She’s really good. Yup. It’s all about the bus. I have always wondered who the heck names these places. We have one here called Autumn Care as though one season is covered but you’re on your own for the other three. I also remember one in my hometown called Jolly Acres. Gag. Bwahahahaha! And here’s to busses . 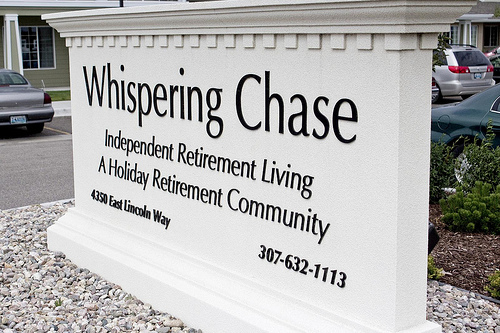 . .
As one who spends WAY too much time in these places, I applaud your naming skills. At least I’d have a good laugh on the way in…..and out, hopefully. BTW, good luck with your aging plan……..may your life be that awesome! We’ll see. It’s been awesome so far. And so far nobody seems to be offended by this humor piece, which is a plus. You never know.